Mondays mornings are so cruel... but at least there is an upcoming long weekend to look forward to! 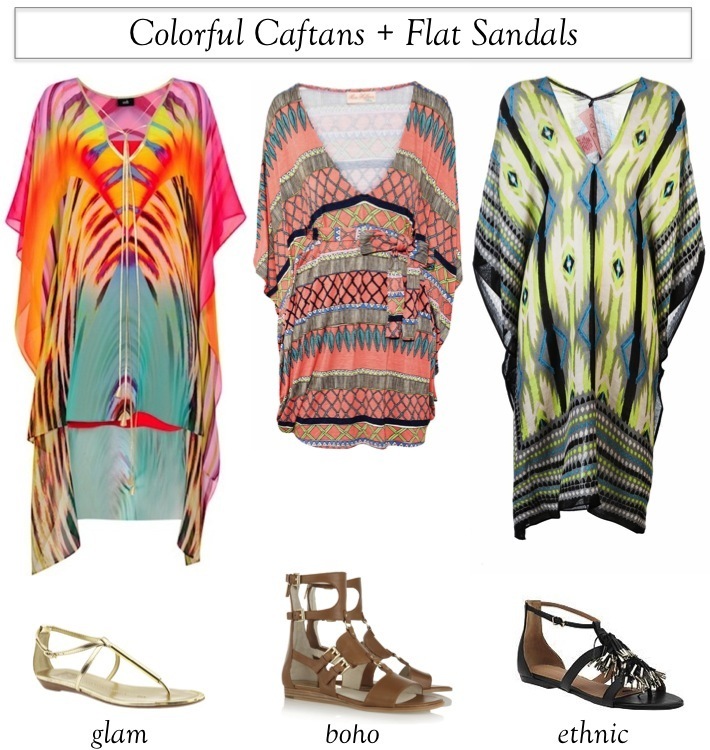 Memorial day weekend is the official kickoff to the summer season and though I'll be spending it at home in San Francisco, I know what I'd be wearing if I was sunning myself on a beach or pool - a colorful caftan paired with cute yet comfy flat sandals. Glam, global, boho- there are so many colorful caftans out at the moment you can find one for any look you are trying to exude. The thing I love about caftans is that in addition to looking effortlessly chic, they hide a myriad of figure flaws. My go to place for bikini's and cover-ups is Victoria's Secret, which has some cute caftans, and to make it even better they just started their summer clothing sale! For flat sandals make sure to check out Steve Madden, which has tons of cute and budget friendly options. I'm in love with all things Mara Hoffman, so the boho look has to be my favorite although I can't deny that gorgeous glam caftan dress or that ethnic inspired Theodora and Callum. Which of the three styles is your favorite - glam, boho or ethnic? I usually just throw on a pair of shorts and a tank over my suit, but these caftans are much cuter options! love that ethnic vibe. I'm totally working to find more stylish cover-ups that transition from beach to eats or whatnot, and these are perfect! This makes me dream of lounging at the beach somewhere far away from this rain in NYC! Oooh love that middle one! So chic! I'm loving the ethnic look. VS really has some great tprices and great looking things. I have been very impressed. I LOVE the Mara Hoffman caftan - its so incredibly comfortable!! I want the glam one too though haha - great picks! I am obsessed with Caftans! Love the outfit! I came across your blog and It's absolutely stunning. I do hope we will be able to follow each other back.. I am a Caftan addicted....thanks to comment on my blog, your is Very good. Hope we keep in touch darling..